Update - All spots are full! If you really really really wanted to participate and didn't get a spot, email me and we can do a "mini swap". If you did get a spot, make sure to email me your address ASAP. Thanks! It's time for the third annual handmade swap. Yay! I have been busy for the last few weeks making some very cool homemade lovelies. I've got a little more work to do, but soon I will have 10 packages all made up for 10 of you. Want one? This is how it works. Sign up to participate and I will send you a package full of handmade goodies, and in exchange you send me a package with your handmade creations. This time around, I will be emailing participants a list of what my packages will contain. That way you will know if it's something you would like and also to make your package comparable. Interested? Email me by Sunday night at nataliessentiments@gmail.com. My only requirements are that you be a blogger (or at least have a blogger profile) or have an Etsy shop. And live in the USA. 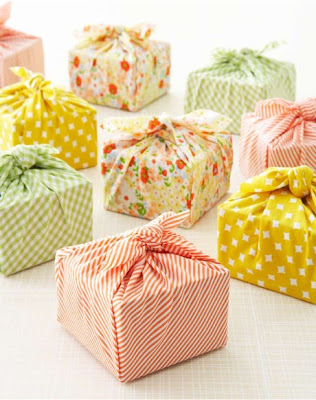 Gift wrap idea from Handmade Weddings. I loved everything in my package last year!!!!!! I love this idea! I want to be a part! But I haven't started up my own blog yet :/ I've got a link and title but the content and what to write and deciding if anyone cares enough to read it literally stresses me out! I do follow you on instagram though, and I read your blog religiously! Could that count?! Ah bummer! I want to play too but don't blog or have an etsy shop. Maybe in the future I suppose. Lord knows I homemake- with the best of them!!! Jami - I have you down to participate. You have a blogger profile which is plenty! I'd love to join in! Jami - make sure to email me. I don't have any way to contact you.